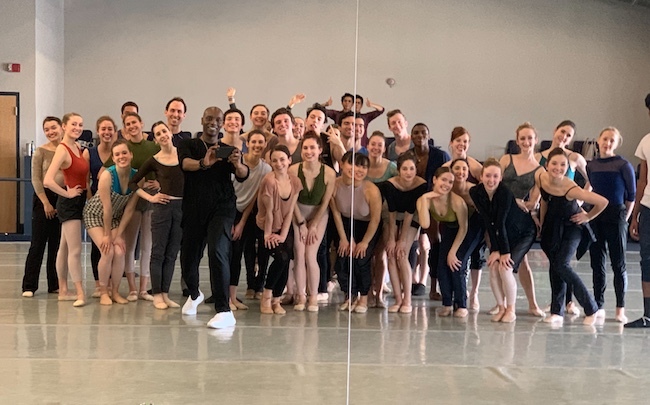 Germaul Barnes, a New York-based contemporary dance artist with a global approach to movement, will premiere his first work created for Alabama Ballet as part of the company’s Ovation series on April 26-28. Ovation is an annual mixed repertory performance that highlights Alabama Ballet’s versatility, strength and artistry while showcasing bold and creative original contemporary works. Germaul Barnes is a choreographer, director, master educator and scholar with a multifaceted career spanning more than 30 years in contemporary dance. He’s known for his bold, urgent, energetic movement style steeped in spirituality and optimism. His work regularly reflects his deep knowledge of and interest in anthropology, dance of the African diaspora, musicality, the human condition and social justice. In his dances, Barnes creates a world that reflects everyday contemporary life, but also address aspects of fantasy, imagination and memory. Barnes is a Bessie Award-winning former dancer and current répétiteur for the world-renowned Bill T. Jones/Arnie Zane Dance Company. Notably, he is also the choreographer of Marley - A Musical, which premiered in 2015 at Center Stage in Baltimore, MD. He has created more than 50 works for his dance collective Viewsic Dance, presented on stages and by companies across the world. He’s also served as faculty and as a guest choreographer around the world, including the Alabama School of Fine Arts. In this premiere, his first commission for Alabama Ballet, Barnes will explore the concept of folding in striking visual and choreographic style. Barnes’s choreography seeks to fuse classical technique with a strong sense of theatricality, risk and invention, punctuated by the complexity of music and sound. Barnes’s premiere features a commissioned score by the electrifying musician and composer KAMAU. Originally from Washington D.C. and now based in Brooklyn, NY, KAMAU’s style blends an intricate use of free vocal expression, melody, percussion and beatbox, all leading to a unique and spirited style of musical expression. Company dancers Nadine Barton and Frederick Lee Rocas and Associate Artistic Director Roger Van Fleteren will also contribute new works to Alabama Ballet’s Ovation program. Performances are set for Friday, April 26 at 7:30 p.m.; Saturday, April 27 at 2:30 and 7:30 p.m.; and Sunday, April 28 at 2:30 p.m. Catch a show at the BJCC Theatre, located at 1001 19th St North in Birmingham. Tickets went on sale March 19 at www.alabamaballet.org. Photo courtesy of Germaul Barnes.